On a rainy, stormy weekday night in downtown Toronto, we stumbled upon Burrito Planet located on 181 College Street. It is located conveniently on the UofT St. George campus and if you are a student there, you have probably visited Burrito Planet more than once. 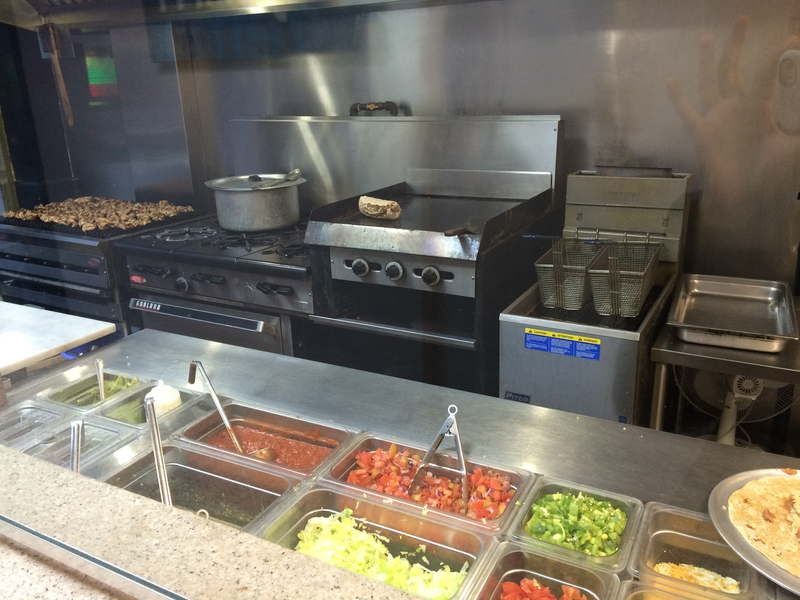 We really liked the simple menu: Burritos and Sides. The last thing we want at a takeout place is an enormous and confusing menu. This place was perfect for a quick bite. 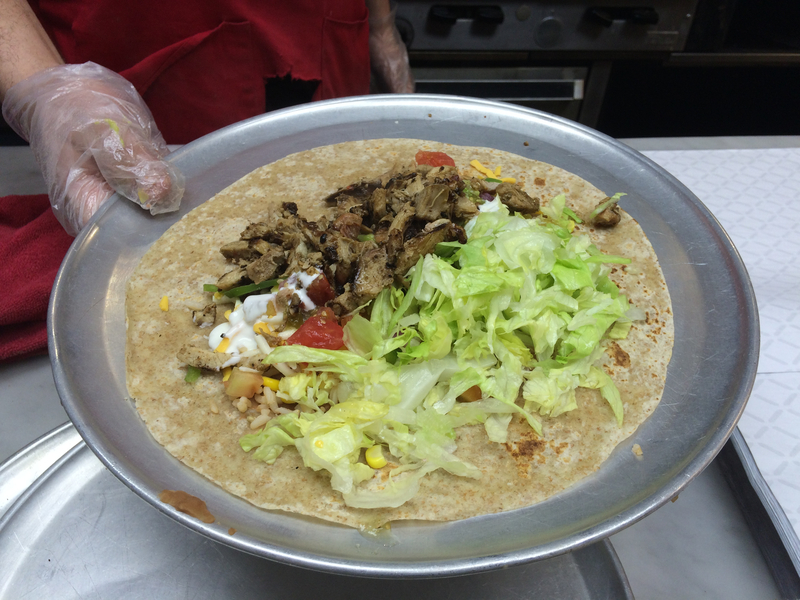 The burritos come in chicken, steak, lamb or veggie and can be regular or large in size. 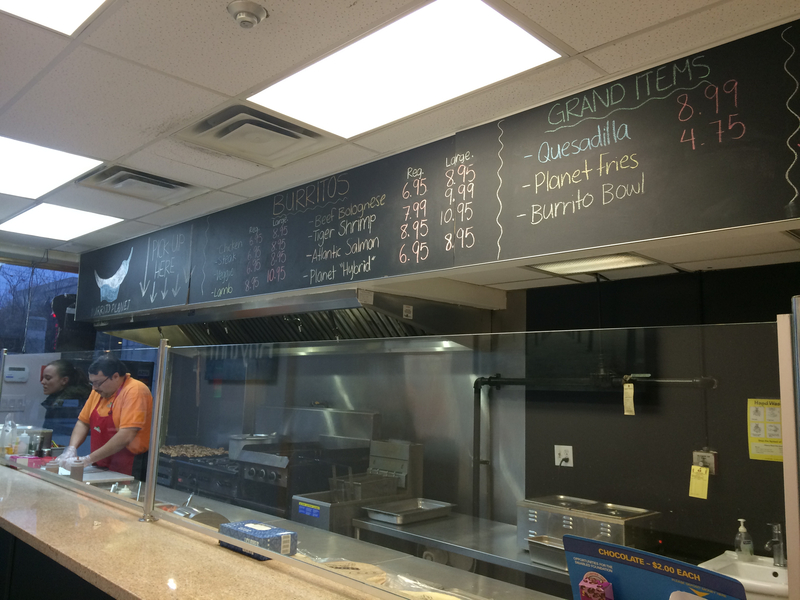 They also have specialty burritos such as the Beef Bolognese, Tiger Shrimp, Atlantic salmon, and Planet Hybrid. We decided to get the regular size Chicken Burrito ($6.95). Although we wanted to try the Planet Hybrid, which has beef, chicken and shrimp, we were too burnt out that day to be in the mood for experimenting. We really liked the neat and clean service and prep area. If you know us you know that cleanliness makes us uber happy. We also found the customer service to be friendly and helpful. These two things helped us forget about our wet shoes and wet hijabs from the rain. 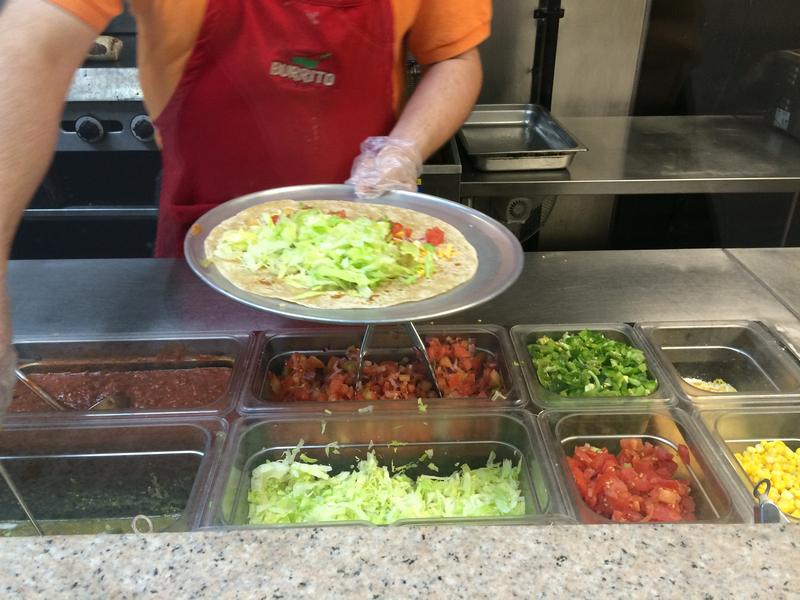 Customers have the choice of white or whole wheat tortilla. Rice and a beans are spread on the tortilla. Next, customers get to pick their toppings (all of which looked super fresh). We got all the toppings: lettuce, tomatoes, salsa, corn, cheese, jalapeños and sour cream. The spice level of the burritos range from mild, medium or hot. Next the freshly grilled chicken was added. Here is a picture of our chicken burrito before it was rolled up and grilled. Here is a picture of how the burrito looked while we munched on it. Sorry for the horrible pictures but we were so hungry that we pretty much inhaled the food. We absolutely loved the smoky flavour of the chicken and wished there was more of it in each bite. The vegetables were crisp and overall the burrito was filling. We had picked medium for the spice level but next time we would go for hot to satisfy our South Asian taste buds. Should you check out Burrito Planet? Most definitely! 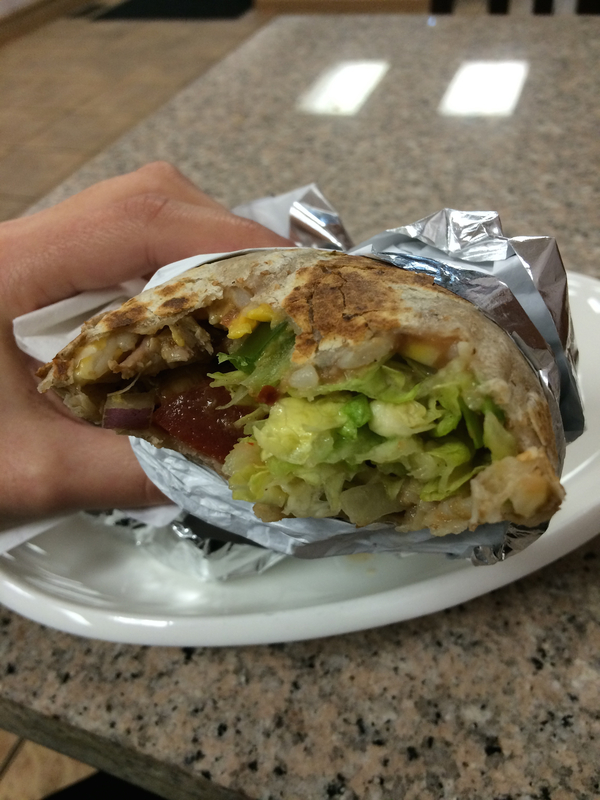 The burritos are great bang for the buck and we found the food to be flavourful and filling. Categories: Restaurant Reviews | Tags: Burrito Planet, Burrito Planet Toronto, Chicken Burrito, Halal Burrito, Halal Chicken, Halal Food, Halal Food Blog, Halal Food Bloggers, Halal Food Downtown Toronto, Halal Food Enthusiasts, Halal food toronto, Halal Mexican Food, Quesadilla, Toronto, University of Toronto | Permalink.